The jobs that are available within Alaskan lodges and wilderness resorts are seemingly endless especially between May and October. While they certainly exist in less of a specific location and in the abundance that fishing jobs do, there are still hundreds of jobs available. Alaska has a very famous allure. 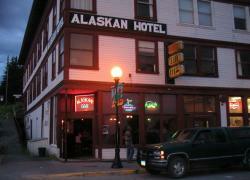 Because of this allure, thousands of tourists flock into Alaska’s cities and forests for their own Alaskan experience. The many lodges and resorts that are being run for the sheer purpose of housing and entertaining these tourists are where seasonal jobs for eager workers, exist. The lodges of Alaska can either be very rustic or five-star resorts. As you can imagine, the wide range of hotels or lodges that exist within this range are all in need of employees. Some lodges run exclusively in certain seasons while others stay open all year. So regardless of the type of employment you are in search of, seasonal or year-round, there is sure to be a position in the hospitality industry that needs filling. Guests typically pick a lodge based on the activities that are offered as well as its location. This is also a good way for potential employees to pick the lodges and hotels they are interested in working for. Some might only care about the earning potential, while other employees are looking for employment of a more adventurous nature. Some lodges may highlight the fine dining experiences they offer while others offer kayaking, hiking and hunting trips. Your job skills, interests, what you hope to gain from your employment and the region the lodge is located in, are all excellent criteria to include in your job search. Potential employees with no experience in hospitality shouldn’t worry. Many lodges are willing to train for positions that require special skills and almost any previous job experience or solid work history is beneficial when applying. Working the many Alaskan lodges and hotels is another great way to earn good money, work hard and generate incredible Alaskan memories. Like cruise ships and fishing, jobs in the lodges need to be well thought out and applied for well in advance. Sending applications even to lodges that haven’t posted for jobs is still a very good Alaska job search tactic, as many jobs are not often listed. Sending a solid resume, good cover letters and following through are also important aspects of procuring any job.